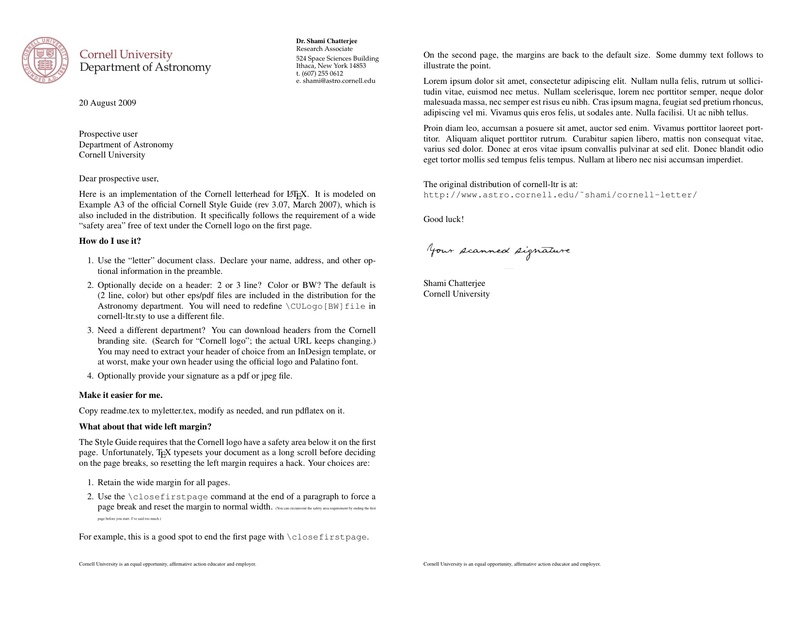 Here is a LaTeX style file for the Cornell letterhead format. It closely follows the layout prescribed in the official Cornell style guide, and comes with headers for the Department of Astronomy. If you need headers for other departments, you can look here, or build your own from the official Cornell logo file (also at the same link) and Palatino font at the right size. Please see the included readme (tex, pdf) file for instructions and an example of how to use the style file. Minimalist distribution: the style file, PDF headers, and readme / example files; 0.2 MB. Extra material: the official Cornell style guide (rev 3.07) and full resolution EPS headers in B/W and color for Cornell Astronomy; 5.4 MB. Here's how it looks. Your comments, suggestions, and patches for the style file are especially welcome!